Beginning with lessons intended for the youngest child and extending all the way to learning about coordinate planes, the Mathematics Scope and Sequence was designed to be a comprehensive resource that provides essential information to Montessori guides for classrooms ranging in age from Toddler through Upper Elementary. As mentioned in the introduction, this was not intended to be a “one-size-fits-all” checklist of all the lessons and materials that should be covered, but instead a resource to utilize when planning lessons and recording student progress. The organizational design of the Mathematics Scope and Sequence was created specifically to be used in Montessori Compass. Within Montessori Compass, guides have access to the entire Scope and Sequence for their classroom, but use the organizational structure and search features to efficiently locate the exact content they need. It is also important to note that within Montessori Compass, schools and guides can customize the curriculum to meet their own needs. Students who learn mathematics by rote memorization often have no real understanding or ability to put their skills to use in everyday life. Learning comes more easily when students work with concrete educational materials that graphically show what is taking place in a given mathematical process. 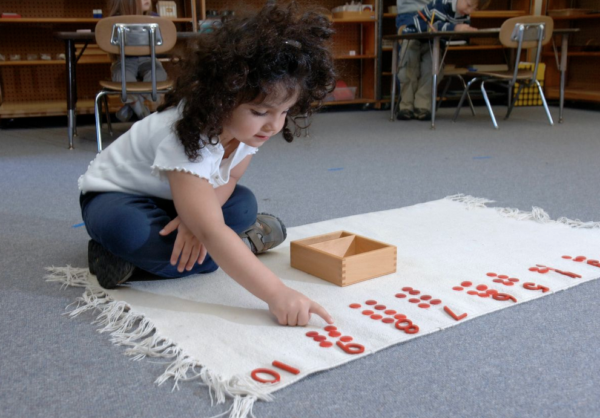 The concrete Montessori Mathematics materials are among the best known and most imitated elements of Dr. Montessori’s work. These elegant and simply lovely materials hold a fascination for children and adults alike. They proceed through several levels of abstraction, beginning with concepts and skills that are the most basic foundations of mathematics, presented in the most concrete representation, up through the advanced concepts of secondary mathematics, which are represented in increasing levels of abstraction, until the student grasps them conceptually. All of the content for Mathematics is divided into sub-categories that reflect these increasing levels of abstraction. The lessons within each sub-category are listed in order in which they would be introduced for most children in many Montessori classrooms. The Mathematics Scope and Sequence is displayed in the following “online magazine” format. Lessons/Materials are listed on the spreadsheet, sequenced the same as they are in the Montessori Compass online record keeping software. Each lesson/material may contain multiple elements, which are tagged to the appropriate cycle year(s). In some cases, parent-friendly descriptions will be listed, designed to help parents gain greater insight into the Montessori classroom.